If you are elderly, suffer from arthritis or other disability that makes digging, planting or weeding your garden difficult, even painful. Using the correct garden tools that have been especially adapted can make a lot of tasks easier and gardening enjoyable again. Adapting your own garden tools can be less expensive and the tools just as comfortable and easy to use as tools specially designed for use in the garden. So if you are elderly or have a disability that restricts movement or a bad back that makes bending painful I have included a few (how to modify tools) tips here. Gardening tools you can make or adapt yourself. If you prefer to purchase ready to use specially adapted tools, I have listed the ones I have tested further down this page. But read on if you like Diy maybe have a bad back or limited mobility or working from a wheelchair making gardening difficult for you or maybe have an elderly or physically disabled relative or friend, read on, these simple tips to make and adapt your own gardening tools really can make many difficult or uncomfortable gardening jobs easier and adapting or making your own tools is a lot cheaper too. These are gardening tools that are easy to make or adapt yourself. Back pain can be a deterrent to sowing seeds, if a painful back or knee condition make the job difficult this simple homemade tool reduces bending. Cut a four foot length of 2 ½ inch PVC pipe making a 45 degree angle at one end. Use the sharp end of the tool to make furrows or holes in the soil. Use the pipe to cover the seeds over with soil. Dampen a piece of toilet paper and use it to pick up the seeds, the seeds will stick to the toilet paper, push the paper the seeds are stuck to into the hole and cover with soil. Take an empty pepper pot or any container with a lid that has holes just large enough to let the seeds through. If you need to make the holes bigger pierce with a small screw driver or scissors. Sprinkle the seeds like you would pepper. Tools to help if you have a weak grip. Making the handles of hoes, rakes, spades or shovels thicker, make the tools easier to use if you have a weak grip. Tools with wider padded handles are easier to grip if your hand grip in not as strong as it used to be. Adapting your own tools by padding out the handles with foam is a lot cheaper than purchasing new ones and can make the tools as comfortable as the adapted tools you find for sale in the shops. How to make tool handles thicker, easier and more comfortable to grip. Cut rectangles out of foam that are long enough to fit your hands and wide enough to wrap around the handle. Slice about three-quarters the way through the width of the foam rectangle, stopping an inch short of the top. Fit the handle of the hoe, rake, spade or shovel into the notch and secure the foam with strong waterproof tape. There are a couple of fairly simple ways to extend the handles of hoes and rakes. One way is to fasten a broomstick handle or similar length of wood, either by screwing or using waterproof tape, parallel to the handle. Make sure the overlap is sufficient to take the weight. Another way is to fit a longer handle to the existing tool head. If adapting your own tools is going to prove difficult I have listed some here I have tested that you can purchase through amazon. these are tools I have tested you can buy from amazon. Can be purchased at the same time to provide extra arm support. It simply plugs into a hole in the back of the tool grip. 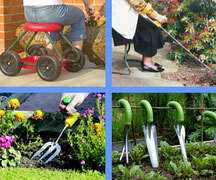 Ergonomic Garden Tools feature a patented ergonomic grip that provides more leverage with less wrist stress. This Gardening range of tools is designed as part of a collection of solutions for improved mobility and independent living. Here's a summary of things you can do to make gardening easier on your body when you are out in the garden. As well as using specially adapted tools elderly, arthritic and gardeners disabled in other ways will find benefit from making a few changes to your gardens, like growing in raised raised beds, having sound surfaces or roll out pathways, rolling seats and kneelers all of these are explained on or linked from my disabled gardening page. Being old or disabled doesn't mean gardening has to stop. Just the opposite, time spent in the garden is good for us and fun. Don't spend to much time at each gardening task, do just as much as you can without your disability becoming uncomfortable. It's more important to enjoy the garden and the exercise you will be getting. If you suffer from back problems it is more practical and makes sense to use raised garden beds to avoid bending and stretching. People with back problems and those paralyzed on one side or unsteady on there feet can carry out most gardening jobs from a non-bending sitting position using long reach tools with attachable extensions and quick release tools. People with weak grips can use ergonomic garden tools to reduce wrist, hand and finger stress and adjustable cushioned handles as described in the tips on this page. Practical changes to your garden need not be expensive and can include Raised beds, Container gardens. Adapting a garden to a more mobility friendly garden layout can eliminate much of the need for bending. Wheelchair gardeners. where possible and this need not be a costly exercise need to adapt there a gardens to be able to get around using the wheelchair. Things to consider when changing a garden to facilitate a wheelchair are gradients, camber, materials and width for paths to make access safe and easy. When buying adopted tools and gardening aids look for lightweight ones made from aluminium alloy, carbon fibre or plastic that are light and easy to use.